We’ve said it in previous blog posts and we’ll say it again here: We’re on a journey with our customers and early adopters through Sway Preview. Our goal is to understand what you like and don’t like, can already do or can’t yet do and what you want us to adjust as we deliver brand new experiences for expressing yourself and bringing your ideas to life. For those of you new to the Sway experience, Sway lets you easily create and share a polished, interactive canvas of your ideas that looks great on any screen. 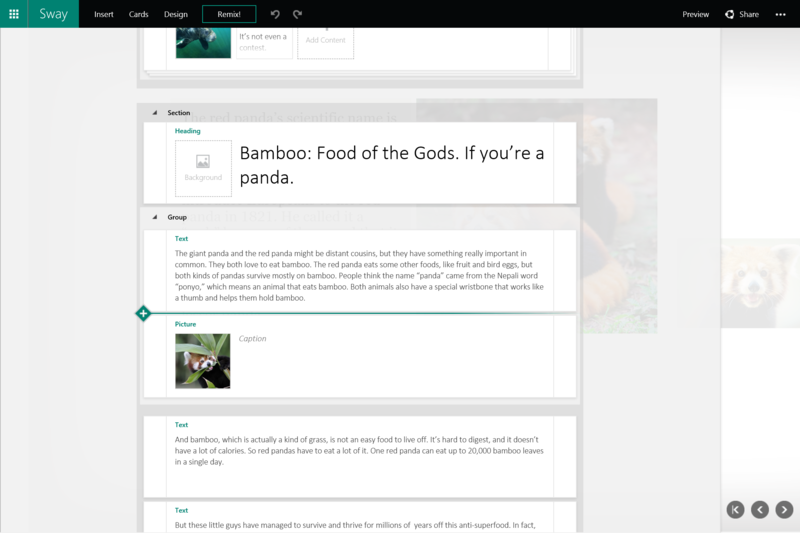 The philosophy of Sway is to help you focus on the human part—your ideas, the multimedia you wish to include and how they relate to each other—while Sway’s built-in design engine takes care of the layout and formatting. That way, you always have something polished and ready to share. Through blog comments, social media, UserVoice, usage data and usability studies, you’re providing us with great feedback and insights. Please keep it coming! 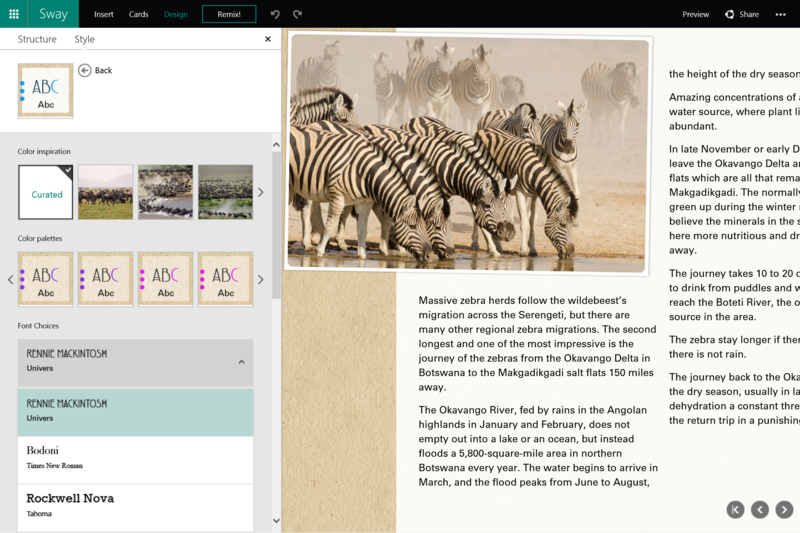 Here are some improvements we’re making to the Sway creation experience thanks to your feedback. The updated Sway toolbar has tabs for Insert, Cards and Design. First, when you tap or click the + button, now you’ll see blank Cards for the most common types of content, which you can add with just a single tap or click. The updated + button lets you quickly add Cards for the most common types of content. Second, if you choose Cards in the top toolbar, you can see a Card gallery showing you, at a glance, all of the different Card types that can be added into your Sway. Simply drag and drop any of these Card options to your Sway, then tap or click to add the multimedia. The Card gallery shows all of the different Card types that can be added into your Sway. Of course, you can continue to drag and drop multimedia directly into Sway from the Insert tab, without adding an empty Card first. Sway will add the corresponding Card for you in the Storyline. As Sway adds support for more types of multimedia and increases the number of ways you can transform your content, you’ll see more types of Cards added in the Card gallery, fleshing out an even fuller set of options available to you over time. We’ve had a lot of feedback about font customization. While there have been lots of different specific requests, the overall point is clear: you want more control over which fonts you use. We want to make sure Sway is oriented towards saving you time with its built-in design engine, but we want to strike the proper balance and ensure you can effectively tweak Sway’s automatic formatting to reflect your style—including selecting which font goes with which style. In the next couple of days, you’ll see an update so that when you select Customize on a style, you will now be able to select the font pair you’d like to use in addition to the color palette. We’ll initially have 15 font pairs to choose from and we’ll continue to add more soon. 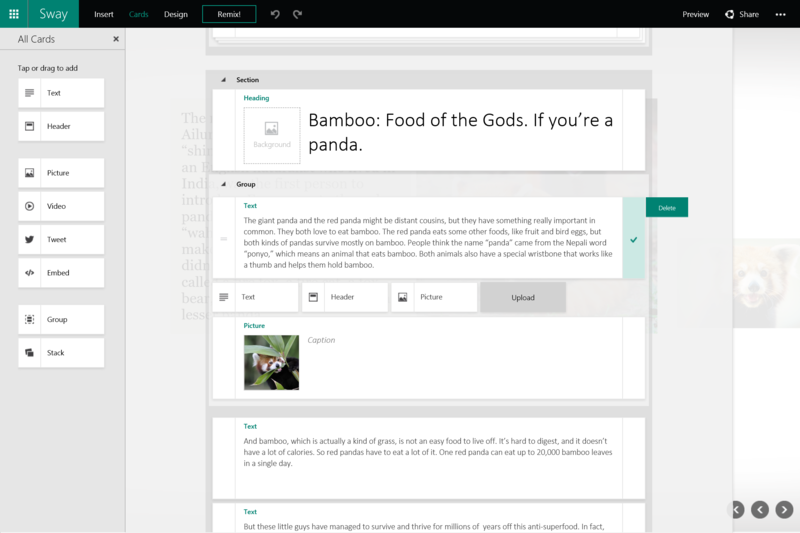 When you select “customize” on a style, Sway now lets you choose the font pair as well as color palette. The + button is used to add content directly between Cards in the Storyline. We’ve gotten feedback that this button’s behavior could be more consistent and predicable. So, we’ve implemented a number of changes that will make it easier for you to use the + button. We’ve increased its size so it’s easier for you to find and then tap or click. We’ve made its placement clearer so you have a better sense of where you’re making changes relative to the rest of your content. And we’ve made changes so it shows up more consistently when you expect it to. The updated + button is now easier to find and then tap or click. Besides updating the + button, we’ve also made updates to the drag and drop experience so it is easier for you to find the appropriate drop target while dragging. Check out this blog post for additional information on the latest set of capabilities of Sway for iPhone. And of course, please continue to provide feedback in the forum on UserVoice dedicated to the iPhone app. We’ll continue making improvements so it’s easy for you to create and share Sways on the go! It’s been great to learn from all of your feedback so far during Sway Preview, and we’ll continue to work hard improving Sway and Sway for iPhone based on your input. We can’t wait for you to see the next set of updates!